Water is one of the most valuable resources on our planet. In Germany every person uses 123 liter daily on average, plus 3900 liter indirect use by consuming goods like textiles or food. But there are many parts in the world where fresh and clean drinking water is not readily available. One solution to this problem is the drinking water abstraction from seawater. This is a very energy intensive process and normally based on fossil fuel power generation. A pilot project by German company biowatt energy GmbH has been installed on the FREQCON factory premises in Rethem and incorporates a specially configured seawater desalination system. 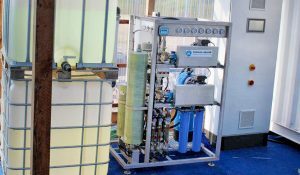 The system is based on the reverse osmosis principle: the seawater is pressurized and pumped through a semipermeable membrane to remove ions, molecules and larger particles from the water. It incorporates 2 high pressure pumps to achieve operating pressure of 60 bar. The pumps run solely on solar power, provided by 21 PV-modules (5.6kWp) and a FREQCON power converter. Depending on intensity of solar irradiation the system runs either on full capacity with both pumps or reduced capacity with single pump operation. FREQCON is implementing the pump controls and a „Maximum Power Point Tracker“ (MPPT) to maximize PV output and drinkable water desalination yield. No batteries or capacitors for energy storage are required. Batteries cause disposal problems and thus environmental problems particularly with regard to remote areas. Consequently battery – free solutions are appreciated. The drinking water is stored in a tank to ensure continuous water supply. After completion of the trial phase the system will be shipped to and installed on the Cape Verde Islands. Another reliable and competitive solution from FREQCON!